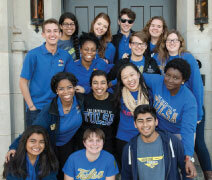 One of The University of Tulsa’s core values is its commitment to humanity, which is also the heart of the health sciences. • 76% of students graduated in the top 10% of their class. 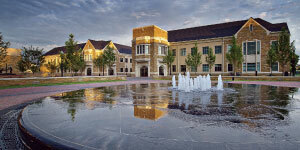 One of The University of Tulsa’s core values is its commitment to humanity, which is also the heart of the health sciences. TU’s new Oxley College of Health Sciences—comprising the University’s School of Nursing; the faculty of Community Medicine; and the Departments of Athletic Training, Communication Sciences and Disorders, and Exercise and Sports Science—offers an excellent curriculum for those interested in the health professions and research. Over the next five years, job growth in the health science professions is estimated to be 25%–38%, depending on the specialty and region of the country. The College has formed a significant partnership with the University of Oklahoma to establish the School of Community Medicine to boost the number of physicians and physician assistants in the state. TU and OU-Tulsa also have a joint affiliation with the William K. Warren Foundation at the Laureate Institute for Brain Research and have forged valuable research partnerships in the areas of immunology, mental illness, informatics, brain imaging, and the neurosciences. On campus, interdisciplinary study is vital to the College, and students and faculty are encouraged to collaborate with other disciplines throughout the University. Each program in the College is accredited by its national governing body. Because TU Nursing students begin their first clinical experiences the spring of their sophomore year, they have five semesters to develop clinical skills. In addition to its conceptually integrated curriculum, which progresses from simple to complex, the school offers opportunities for study abroad. Nursing school graduates are prepared for employment in hospitals and community health agencies. Certified athletic trainers specialize in the prevention, recognition/evaluation, treatment, rehabilitation, and reconditioning of injuries due to physical activity. 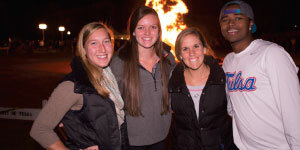 TU’s program combines an extensive core of academic study with in-depth clinical rotations through intercollegiate, interscholastic, professional sport, industrial site, and sports medicine clinic settings. Students pursuing professional careers in speech-language pathology receive clinical training and research opportunities in a field that requires a master’s degree. Undergraduate students follow a strict sequence of basic science and pre-professional courses and participate in a practicum at the University’s on-campus Mary K. Chapman Speech and Hearing Clinic during their senior year. Graduate students study communication sciences and disorders and participate in practicums at the clinic as well as ina hospital/rehabilitation center and a public school setting. Students can choose a track in thismajor that aligns with their career goals. The General/Fitness track is preparation for careers in the fitness industry or in physical education. The Pre-professional track prepares students for graduate programs in Exercise Physiology, Biomechanics, or related fields. Students can also take courses required as prerequisites for medical or allied health fields, including physical therapy, physician assistant, or medical school. The Oxley Foundation presented a generous donation of $15 million to the College of Health Sciences to provide critical support during the College’s launch in fall 2015. The William K. Warren Foundation and Saint Francis Health System presented TU and OU $10 million in 2015 to establish an endowed scholarship fund to assist and support the higher education needs of medical students attending or preparing to attend the OU-TU School of Community Medicine in Tulsa. TU and the Laureate Institute for Brain Research (LIBR) made headlines in 2014 with the release of a University study published in the Journal of the American Medical Association. The TU/LIBR researchers reported that, compared with healthy controls, college football players with and without a history of concussions exhibit less volume in the hippocampus, a brain structure related to memory and emotion.